Over the last 6 years, IGG Software has continued to lengthen their lead in the Macintosh Personal Finance space, becoming the dominant player assisting you with all aspects of your Financial Life (ironically, that’s what the aborted attempt at re-writing Quicken was supposed to be called). Unfortunately, as I predicted, Intuit has only made one improvement to Quicken Essentials for Mac since I wrote my article 4 years ago: you can now export to TurboTax (wow). But I digress, this article is about iBank 5, the new offering from IGG Software in the iBank line. A piece of software I’ve been running (and loving) since 2011. Bill Pay – You heard it, you finally have that long-lost feature back in your Personal Finance software, thanks to IGG Software you will now be able to connect directly to your bank for bill payment. One-button Updating – A new “Update Everything” button for handling all of your account downloads, device synchronization, and investment updates. The goal with this feature is to allow you to significantly minimize the number of manual transactions you enter (I won’t be using it for that reason, but more on that later). Direct Access – This is a feature that IGG Software introduced in their iBank for iPad application last year, it is a subscription service ($4.99 per month, or $39.99 per year) that links to your online financial accounts and makes all transactions (even pending ones) available in your iBank applications. Once only available on the iBank for iPad, this update brings it to your desktop. Better Budgeting – The budgeting feature in iBank (something I don’t use much, but may now) has been improved dramatically by automatically incorporating Scheduled Transactions (which I use a lot) into your Budget. Budgets will also now auto-update based on changes and will synchronize to iBank for iPad 2. Budgets were probably the weakest area of iBank previously. Existing users of iBank 4 will be able to upgrade in-app or at the IGG Store for $29.99. You just download iBank 5 and follow instructions for “Secure purchase”. So, with a 30-Day Demo available for iBank 5, let’s peel back the covers and see how it looks. You can download a full-featured demo of iBank 5 from the IGG Software website. In my first review of iBank I complained that IGG Software didn’t provide a link to your Applications folder in the disk image, now they do. Installation is now a simple drag-and-drop onto the provided Applications folder link and you’re done. 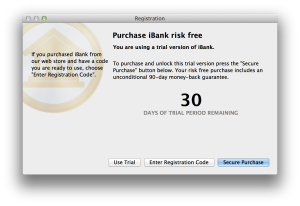 Upon first launch of iBank 5 you’re presented with a licensing screen, I clicked Use Trial and began my 30-day Demo. 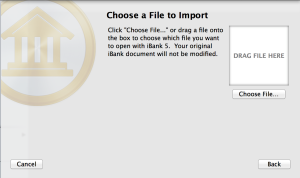 Once past the licensing screen, you are presented with the Welcome to iBank 5 screen where you can choose to Start Fresh (create a new data file), Import from iBank (prior version import), or Import from Other Software (we know who “Other” is…). I chose to Import from iBank as I’m already a customer. However, before doing this I backed up my 41MB iBank 4 data file to ensure I wouldn’t have issues should something not work in the Demo. I’ve been an iBank user since 2011 when I switched from Quicken to iBank. I have a VERY large data file with tens of thousands of transactions dating back to 1995 and over 80 different accounts. I had a nightmare moving from Quicken to iBank due to the complexity and number of transactions I have. Upgrading to iBank 5 was easy! The import screen asked me to Chose a File to Import, which I didn’t expect. Why doesn’t it know where my iBank 4 data file is? Or, why couldn’t it just quickly scan and find it? This seemed a bit onerous. Nevertheless, I selected Choose File… and pointed it at my current file. You are then presented a screen to Save Your Data. At this point, I know what’s going on. The file formats between iBank 4 and iBank 5 have changed. iBank 5 is going to actually import and convert the data to the new format. The import process took approximately 2 minutes for my data file and then I was presented with a status screen. The status screen was titled We fixed your database (I didn’t know it was broken) and amounted to notifying me of a missing password for an online account, and some of my investment transactions which were missing “distribution types” and were changed to “cash”. You are also asked to give iBank 5 access to your Reminders, Calendar, and Contacts, at this point, which I granted. More on this later as well. I was then presented a Congratulations screen and got to see the new interface for the first time. Upon initially looking around, I found a couple of anomalies. The first was that there was an error message being displayed, stating that “This document needs updating”. I tried saving my file, no change. I tried quitting and restarting and was then told iBank 5 wanted access to my Keychain to gain access to my synchronization server credentials. I granted the access and then clicked the Update Everything button (looks like a Refresh button in the toolbar). That seemed to clear the error. The second, and this is probably just a “Rob Thing”, was that my Registers were all sorted in descending order (the newest transaction is at the top, the oldest at the bottom), I prefer ascending order and keep all my older transactions at the top, with the newest at the bottom. This also led me to check something else I had hoped would be addressed: was there a blank, new, transaction waiting for me at the bottom? Nope. You still have to ⌘N** (**command-N) to get a new transaction. The good news is that if you do it accidentally, you can now click Cancel and it will be deleted (you don’t have to delete it manually like in version 4). So, a nice set of improvements. 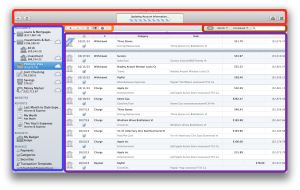 Toolbar: MUCH cleaner than previous versions, even…minimalist. By default there are only 4 buttons (Add, Update Everything, Pay Online, and Post), and only a Calculator available to add. Gone are Add Report, Add Budget, Download, Web Download, Download Quotes, Sync Devices, Confirm Scheduled and Search. Clearly the Update Everything feature removed 4 of these by itself. The others re-appear elsewhere in the UI. Transaction Bar: I’m not sure of its official title, this is what I’m calling it. The first pair of buttons provide Adding and Removing transactions. The next set of three buttons provide different views of your Register: Regular (shows all transactions), Resolve (view “New”, “Matched”, and “Uncleared” together to assist in reviewing downloaded transactions), and Reconcile (same as old Reconcile view). Transaction Filter Bar: Again, probably not “Official”, but what I’m calling it. Select from All (yep, all transactions) or filter by Month / Quarter / Year or Uncleared / Cleared / Reconciled. Accounts Pane: Not much has changed. Gone are the colored icons (though the icons themselves are the same). Indicators of online accounts now show a “Cloud”. The Regular, Resolve, and Reconcile view buttons are nice. Selecting Resolve allows you to quickly see older, unreconciled transactions in your Register. I usually only notice these when I’m performing an account reconciliation, so this is an easy way to find those at any time. I mentioned earlier that I wouldn’t be using the Update Everything to manage my transaction downloads. This is mainly because I use iBank to verify what my bank is telling me, so I manually enter all of my transactions myself. That way when I reconcile my accounts, I’m performing an actual reconcile. If you always download from your provider and then reconcile your statements to what they’ve already provided you, guess what…they always reconcile. I learned to reconcile my checking account as a kid and it’s always stuck with me, so I’ve always entered my transactions myself. However, if I was a “fully automated” financial person, I would certainly be trying out IGG Software’s **Direct Access **to perform that automation, especially now that it shows Pending transactions as well. The transaction filters are also a nice addition and I’m finding that I keep mine on Quarter to cut down on the volume of transactions iBank has to manage. This also speeds it up considerably. Unfortunately, it also removes future dated transactions, even if they will be happening in the current quarter (it’d be nice to see them). I took iBank 5 through some of my normal financial workflows to see how this version compared to the older one. Entering transactions works the same as it did in iBank 4. There is a small improvement in the speed as you’re moving from field to field. My biggest complaint in iBank 4 is that the auto-complete was terribly slow as you’re trying to type in a Payee, iBank 5 isn’t a lot better (some, not much). I did have some issues with cutting and pasting transactions between accounts. This has always been…finicky, but iBank 5 is more so. I found I would have to switch to another account and back again, before I could get transactions to be able to cut (or copy). The Edit menu always seemed to be stuck on “Undo Paste” from my prior paste operation. The first thing I notice is that the “Checkbox” for reconciling a transaction has been moved to the right of the transaction (from the left). At first, I didn’t think I would like it, but then as I used it the utility of the change became apparent. By having the checkbox near the amount, you don’t need to have as much of the iBank screen up to quickly reconcile against a digital statement (as all of mine are thanks to FileThis Fetch and my Hazel Script. I have to talk about speed again here. Every time I check a transaction as reconciled, I see iBank 5 write to disk, and there is a noticeable lag while that happens. You’ll actually see the application freeze. Try it, check off a transaction and try to scroll at the same time, won’t work. It’s aggravating! I didn’t use budgeting in iBank 3 (or 4). I decided to give it another try with iBank 5. I created a new budget and it prompted me to identify the Accounts I was going to use (or keep with all) and the Categories I was going to use (or keep with all). It then looked through my Scheduled Transactions and found both of my household’s paychecks (my wife and I) as income. The next step again went through all of my Scheduled Transactions and found expenses. I noticed one of the expenses was wrong, so I clicked the Edit button provided, only to receive an error telling me I could not edit the transaction template from there. 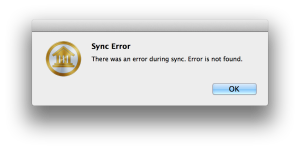 If you’re going to give me an Edit button, don’t give me an error. So, you will need to make sure all of your Scheduled Transactions are correct before going into the Budget process, otherwise, you have to abandon the setup and go correct them. You will then be prompted to Set up Envelopes if you’re interested in Envelope Budgeting. All of your “Envelopes” will then be presented with the starting cash that should be in each one of them. The Budget will then be created. The envelopes will be exposed under each Category you originally setup an envelope for, and transactions will be credited or debited from the envelope, giving you an electronic view of each of your physical envelopes. Very nice. You can then move forward and backwards through the months to see how you’ve been doing on your budget, and what to expect coming up. I’m definitely going to explore this more in depth and see if I can adapt it for my personal use. The only strange behavior I saw was that since I have our Paychecks defined with all of the deductions, those become budget categories. I’ll need to tune the budget, as seeing Payroll Taxes being my largest budgeted expense is just depressing. 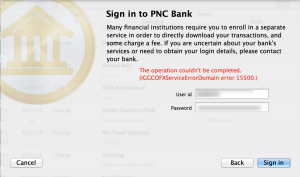 There are a few problems in iBank 5. They’re relatively minor and shouldn’t dissuade you from using the software, but you should be aware of them. Hopefully this will be addressed in a future update. Might be related to the fact that I’m using a private WebDAV server as the synchronization point. All of your Scheduled Transactions are placed on your Reminders…for every due date (these are stored in an iBank list under On My Mac). You can control this behavior from within iBank 5 under Manage then Scheduled Transactions in the left navigation. There is a small checkbox in the top-right. I’m not actually sure why you’re prompted to provide access to your Contacts and Calendar, I cannot find where they are used. Don’t allow it. Weird Save Behavior: I’m not sure what else to call this. iBank 5 appears to update the data file every time you do anything in iBank 5. The only reason I notice this is that I have my Documents folder in my Dock and it always shows the most recently updated file. When I’m using iBank 5 I see my data file constantly being updated, it’s kind of annoying. On the other hand, it gives me some solace knowing that all of my changes are being immediately saved in the case of a crash. Scheduled Transactions: This is a minor issue, but when Posting a scheduled transaction, it doesn’t automatically select the next one. iBank 4 did. My initial article on iBank 3 had one “Bad” item: Speed. I also had issues with performance under iBank 4 as well, it was just plain sluggish depending on what you’re doing. I notice it most whenever I’m searching transactions, the application always “Beach Balls”, but if I just wait, it will eventually finish. I also notice it when entering a new transaction and tabbing between fields, especially when using the auto-complete. iBank 5 is noticeably quicker, but not where I’d like it to be. This is where IGG Software should be focused in the future with iBank as the sluggishness pervades all of your use of the product. Making transaction entering, searching, and updating faster would vastly improve a newcomer’s impression of the product. “Notify me when an update is available” is not still not selected by default – Make sure you check it off under Preferences. I’m sure the concept is that if you buy from the App Store, you’ll be notified by Apple; so my suggestion to IGG Software is to just leave that option out of the App Store version, but check it by default on the download version. Make Transaction entry faster. Period. This is what people are doing with the application, it needs to be very responsive. Fix the caching to disk on every change. I shouldn’t notice the updates you’re making in the User Interface, and right now I do. Please give us a “Sync Devices” button for the Toolbar. I don’t want to “Update Everything” all of the time, the choice is already under the File menu, just expose it as a button. Adding new transaction should date it with today’s date, always. Allow something like a shift-plus to add transactions with a date of the last edited transaction. Create a non-saved, blank transaction, dated today, sitting at the bottom, or top, of the register, to allow for quick entry of a new transaction. When entering a stock, don’t convert the name to the symbol (or make it a preference). Please fix the issue for scheduled transactions not auto-selecting the next one, the more I Post my Scheduled Transactions, the more annoying this gets. Too long, Didn’t Read (tl;dr): iBank 5 is worth the upgrade. There are still some speed / performance issues, but it is an upgrade you don’t want to miss. 20131130 – Article updated to reflect retail version of iBank 5, all references to Beta removed.